Having looked at various paint removal methods in the last issue, by now we’ve stripped the old finish to bare metal—or we have an original finish where the paint is adhering with no failure problems such as cracking, chalking, or pinholes. In both cases, the process of preparing the surface for paint is similar. Your goal, through a process of gradual refinement, is to create a surface as perfectly smooth and as free from flaws as possible. You will use a medium primer surfacer to fill and build up the flawed surface, then you’ll block-sand it to level out this primed surface. First, let’s discuss a very important requirement before priming: a clean surface. If the surface is bare metal, then a metal conditioner such as metal prep for steel and aluma prep will clean it, physically and chemically. Promoting adhesion through cleanliness and following the paint manufacturer’s instructions during each step of the process is extremely important. If that beautiful paint job you’ve spent so much effort to create doesn’t stick to the metal underneath, you’ll have to strip it off and start over. A painted surface must first be thoroughly cleaned with a wax and grease remover. Modern waxes contain silicone, which must be removed before new paint can be applied. Nothing sticks to silicone. Another way to clean existing paint that also etches it is to scrub the old paint with Scotch Brite and powdered Comet-type cleanser. Be careful to avoid scratching glass and chrome if you use this method. After the finish is thoroughly clean, the next step is to repair the chips and scratches. Remember, the new finish will only mirror the surface to which it is applied. Ninety percent of paint work is preparation. The actual spraying of the color coats is a minor part. Broken areas such as chips and scratches should be feather-edged, i.e., the chips must be sanded smooth and gradually tapered back to the surrounding level so that you feel no edge. This can be done easily using a sanding machine such as a DA or Jitterbug. Start with an 80-grit disc to work the rough edges down, then finizzzsh with 220. Existing paint should also be sanded with a 220-grit dry or 360-grit wet to remove any evidence of gloss. Thoroughly clean the surface, paying particular attention to nooks and crannies where paint dust or sludge may accumulate. Finally, wash the entire surface with wax and grease remover. After the surface has been cleaned and prepared for painting, be careful not to touch it with hands or gloves or in any other manner. Check the surface for smoothness by rubbing your hands over it before the final cleaning. Even after washing, your hands always have a certain amount of oil on them, which is sufficient to destroy the durability, adherence, and appearance of your new finish. Before spraying any primer or paint, cover and protect adjacent areas from overspray. Areas to be protected should be covered with masking paper held to the body by masking tape. Good quality masking paper and tape will permit no paint to penetrate or seep through to the panel, chrome, or glass it is protecting. Tape must adhere easily to painted surfaces, chrome, glass, or stainless steel. Equally important, no adhesive must remain on the surface after the tape is removed. Years ago I had the misfortune of using some inexpensive tape. To make things worse, the tape stayed on the car for several weeks. I ended up removing it with lacquer thinner, steel wool, and a safety razor blade. The inferior tape adhesive stuck to the chrome, rubber, and glass and literally had to be scraped off. As I recall, this took me several days. Believe me, a roll of 3M tape is cheaper than several days of labor. Even new sheetmetal panels have grinder gouges and stamping flaws that make the surface less than perfect. The typical paint job, only a few thousands of an inch thick, will only accentuate flaws. Primers and primer surfacers are designed to fill these imperfections. Primers are relatively thin undercoatings whose primary function is to promote adhesion between bare metal and subsequent coatings. Their secondary function is to prevent rust. Aluminum and zinc-coated panels require special primers for proper adhesion. Although primers provide excellent adhesion and rust protection, they are relatively thin-bodied and have poor filling or building characteristics. Primer surfacers are formulated to provide good filling properties with relatively few coats. Several types exist. Catalyzed primer surfacers, such as Glasso MS primer filler, dry very quickly with minimal shrinkage. A primered panel can be sanded in as little as one hour after priming. 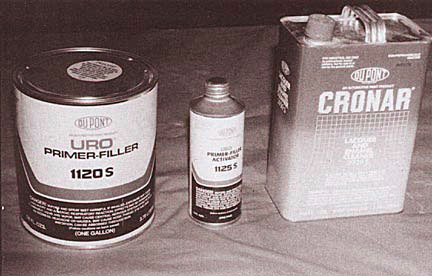 Lacquer-type primer surfacers such as DuPont 131S can require much longer to dry completely, and shrinkage can be a problem. Drying time is extremely important. I’ve found it best to give primer surfacers plenty of drying time. All surfaces have some shrinkage as they continue to harden or dry. Sanded too soon, they continue shrinking, causing small flaws or distortions in the final painted surface. Whenever I do a show-type paint job, I let the primer surfacer dry for up to several weeks before sanding, depending on weather conditions. Use blocks for all sanding. Bare hands don’t provide enough support to level the primer surface evenly and can even create ripples in the final finish. Generally, use the longest block possible; too-short blocks don’t show up the low spots. Determining whether or not a panel is truly smooth is easy after the final paint is on, when reflections show up every minor undulation, but you can detect them while blocksanding. First, the contrasting guide coat will remain in low spots, so you know where you have to sand or fill. Second, your hands can feel unevenness; put your dry palm on the metal, and move it sideways as well as back and forth. Thin fabric work gloves may help. When you’re almost finished block-sanding / clean off the sanding dust and dampen the panel with a damp (not wet) rag. Sight down the panel under the right lighting, and you’ll see reflections in the damp sheen. Pre-Kleano and other slow-drying solvents can also show reflections similarly. This work brings us to the point where we are ready to begin painting. In the next article we’ll look at the various types of paint and go over the painting process, from application of sealers to spraying the color and finally, color sanding and final finishing.